Israel has carried out strikes on Hamas targets in Gaza, after a rocket attack on a house injured seven Israelis. Gaza's health ministry said seven Palestinians were injured. Militants later launched a barrage of rockets towards southern Israeli towns despite reports of a ceasefire, triggering further Israeli strikes. So far no Palestinian militant group has said it fired the long-range rocket that hit the house in Mishmeret, north of Tel Aviv, on Monday morning. The Israeli military blamed Hamas, but one unnamed official from the group said it had "no interest" in doing so. The escalation follows months of tensions at the boundary fence between Gaza and Israel, and two weeks before Israel holds a general election. Israeli media report that the Israeli side of the border has been quiet since 03:15 (01:15 GMT), and that the last Israeli strike on Gaza took place at about 04:30. Overnight, Palestinian militants in Gaza fired more than 60 rockets and mortars towards Israel, according to the IDF. About 30 of the projectiles were launched after Hamas said it had accepted an Egyptian-brokered ceasefire agreement that would start at 22:00. 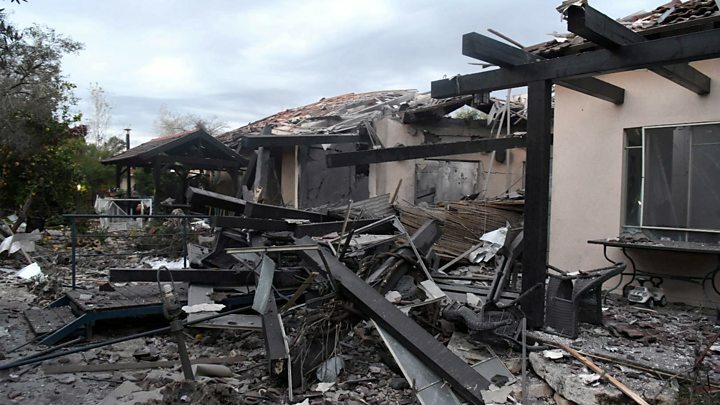 No injuries were reported in Israel, but a home in the town of Sderot was hit by a rocket that did not explode. The IDF said, in response to the rocket fire, fighter jets and helicopters struck 15 targets in Gaza, including a Hamas military compound in the central town of Deir al-Balah. Gaza's health ministry did not report any casualties as a result of those strikes. Israeli Prime Minister Benjamin Netanyahu said he would immediately go to the IDF's headquarters when he returned from a curtailed trip to the US on Tuesday. "We'll deal with these issues," he said. "We gave a very powerful response. Hamas needs to know that we won't hesitate to go in [to Gaza] and take any required steps." Meanwhile, Public Security Minister Gilad Erdan told Israeli Army Radio that "rumours of a ceasefire are incorrect". The BBC's Yolande Knell in Jerusalem says Mr Netanyahu may want to avoid an unpredictable escalation before a closely-fought general election, but he is under intense pressure to show he is taking decisive action against Hamas. A rocket launched from the Rafah area in southern Gaza hit a house in Mishmeret, about 120km (75 miles) to the north, damaging the building and setting it on fire. An IDF spokeswoman said Hamas - which has fought three wars with Israel since 2008 and is designated a terrorist group by Israel, the US, EU and UK - had manufactured the rocket and was to blame for its launch. What did Israel strike in response? The IDF said it had struck dozens of Hamas targets across Gaza on Monday evening - a response that Mr Netanyahu described as "very powerful". The targets included the office of Hamas political leader Ismail Haniya in Gaza City's Rimal district. There was no indication that Mr Haniya was inside at the time. 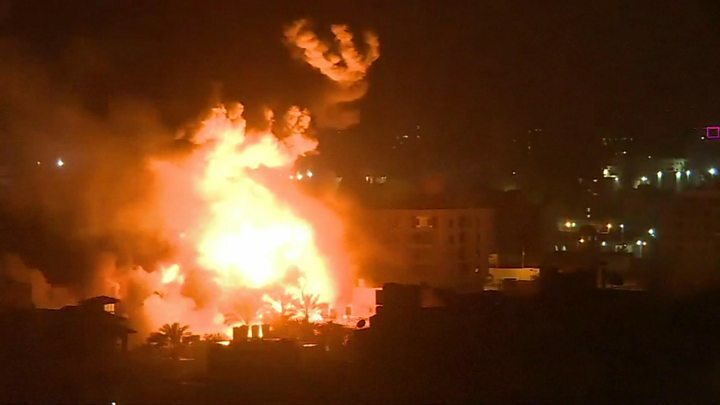 The IDF also said it had bombed a five-storey building in Gaza City housing the offices of Hamas' Internal Security Service, and a three-storey building in the eastern Sabra district that was the "secret headquarters" of Hamas's General Security Forces, as well as its General Intelligence and Military Intelligence agencies. The official Palestinian news agency, Wafa, reported that two Palestinians were injured when jets fired missiles at a commercial building in central Gaza City, and that one other person was hurt in a strike in the eastern Shujaiya district. A Hamas website, The Palestinian Information Center, said blocks of flats, civilian facilities, agricultural land and "resistance sites" had been targeted.